The What: Altinex has released its TNP358 Tilt ’N Plug Interconnect Box. Designed for mounting into tables, podiums, or other furniture as part of a presentation system, this connectivity / power solution enables greater plug-and-play options in meeting or presentation spaces. 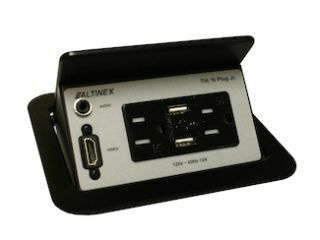 TheWhatElse: The Altinex TNP358 interconnect box is available in both black or brushed aluminum finishes and includes dual AC power sockets, two charging USB ports, HDMI ports, and audio connectors. The TNP358 was specifically designed for devices requiring a charging USB port, such as smartphones and tablets. The two USB ports can deliver up to 3 Amps of charging power. A single input power cable delivers power to both AC outlets and features a GFCI (ground fault circuit interrupter) plug for added safety. Notably,the unit is UL Listed—ensuring the highest safety standards. The box’s input plate is accessed by pushing down on the top cover. The unit then auto-tilts open with assistance from an internal spring. Once open, the input plate remains securely in place. The input plate is hidden, or closed, by pressing down on the top cover until the latching mechanism engages. In its closed position, the top panel lies flush with the table's top, held in place by the latching mechanism. The fit also means less chance for paperwork to catch the TNP358’s edges when being passed across a table. TheBottomLine: The Altinex TNP358 Tilt ’N Plug Interconnect Box is available now for $672.